This time is different. No, really! The phrase “this time is different” doesn’t usually spark very positive reactions. But I don’t care because there’s one thing about the market these days that makes me think that something is strange when compared to previous bond market sell-offs. If you follow me on twitter you will have noticed that lately I have been talking a lot about asset swaps (ASW). This is a pretty technical concept but I will try to be as straightforward as possible. Buying bonds requires balance sheet and IRS is an off-balance sheet instrument. Buying government bonds creates exposure against the issuer (sovereign) while IRS is a contract between two counterparties (e.g. banks). Supply of bonds is limited while IRS can be created out of thin air. Government bonds are a stream of cash flows (coupons) while IRS is an exchange of fixed against floating rate (e.g. LIBOR). I have learnt to pay a close attention to moves in ASWs, just like I very closely monitor moves in cross currency basis because they can reveal pretty significant market developments. An ASW can tighten, i.e. bond outperforms the swap (e.g. bond yields drops by 10bp and IRS for the same maturity by 7bp) or widen. In core markets, tightening of ASW has been historically connected with higher aversion to risk. When problems arise, investors would very much rather own, say, US Treasuries than have a contract with a bank to exchange some cash flows. 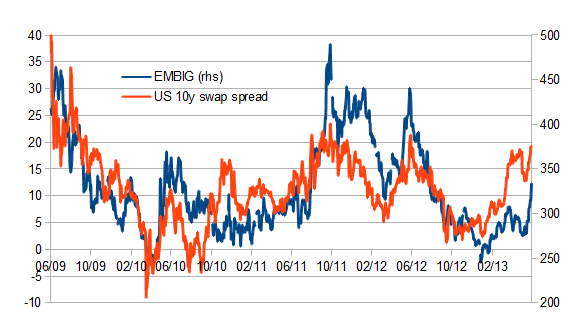 Chart below shows the 10y ASW (the higher the number, the more expensive the bond vs swap) in the US against the EMBIG spread. As you can see, the correlation is pretty significant. Now, what happens in developed markets does not usually work the same way in emerging markets. Indeed, periods of risk aversion were generally associated with significant widening of ASW in emerging markets. The rationale is simple – let’s dump emerging bonds because the credit risk is going up. Having an interest exposure via a swap with JP Morgan becomes more valuable than buying government bonds of governments of Mexico, Hungary or Malaysia. Simple heuristic. And this brings me to the “this time is different” proposition. As you may have noticed we are experiencing the end of days for government bond markets. Well, we’re not really but people like Bill Gross want to make you think like that. EPFR data is showing significant outflows from bond funds investing in emerging government bond markets. The last time we saw such big outflows was in September 2011. However, unlike in September 2011 when ASW totally exploded, in the recent weeks EM ASWs have actually tightened and considerably so. Just to give you an example – ASW in the 10y segment of the South African government bonds are at the tightest level they’ve ever been. South Africa – the country whose economy is in a downfall, whose currency has sold off dramatically and where the social tensions are at levels unseen in years. To be sure, the bonds have sold off too but nowhere near as much as IRS. I can find a few explanations for that but the most important conclusion is that real money investors (so asset managers rather than hedge funds) have not been selling government bond markets to a large extent. They have sold some and shifted others to more defensive places, they probably hedged their currency exposures but they have not sold their bonds. Why? Perhaps because they don’t believe Bill Gross, thinking the scare will pass (this argument seems to be supported by Pawel Morski in one of his latest posts). Or perhaps because they know the market is not able to absorb the potential flow anyway. All in all, I don’t want to make this post too technical but this is the first EM bond “crisis” since I have been in the industry when local bonds in emerging markets have so far been outperforming IRS and ASW have been tightening. And while I think I understand the reasons behind that this is not a sustainable situation, in my opinion. In fact, I strongly believe that something has to give – either the real money guys are in a denial or the hedge funds have jumped on the tapering bandwagon too early. Either way, the EM curves are pricing something that is almost impossible to come true, in my view.